If you are an avid user of long-distance applications in hunting, security, surveillance, and law enforcement, just to mention a few, you know all too well that takes extreme precision to win. In addition to precision, your scope should be relatively light to carry around, flexible to be used on with many different rifles, have tremendous zooming functions, be easily calibrated, and providing a great deal of image quality. In this Pulsar Apex XD50A Thermal Riflescope review, we explore these features and many more, with the view to giving you as much information as possible so that you can make an informed choice. 1.12.1 Q. Who are the manufacturers of Pulsar Apex XD50A Thermal Riflescope? 1.12.2 Q. Is the riflescope shock-resistant? 1.12.3 Q. What colors can I purchase the Pulsar Apex XD50A Thermal Riflescope in? 1.12.4 Q. Is the Pulsar Apex XD50A Thermal Riflescope water-resistant? 1.12.9 Q. What are the dimensions of the riflescope? 1.12.10 Q. Does the scope come with a remote control? 1.12.12 Q. Is the scope used for hunting only? A very outstanding feature of the Pulsar Apex Thermal Riflescope is its high-resolution LCD display screen, which provides an excellent preview of your target. Furthermore, a high-resolution LCD display screen means that you don’t have to put much stress on your eyes in order to perceive your target. Finally, the LCD screen also makes it possible to capture fast moving targets on your scope. The Pulsar Apex Thermal Riflescope comes with a wireless remote control that allows you to access some of the scope’s features without necessarily being close to the scope. Being able to access scope functions without losing out on the action in the field is definitely a plus from this scope. The one-shot zeroing function of the Pulsar Apex Thermal Riflescope saves you the trouble of shooting more than once in order zero your riflescope. After the zero shot has been taken, the freeze function captures your target’s frame in memory; and all you have to do is align the reticle with the stored frame. That’s it, now you can zero your rifle without wasting shots. With the Pulsar Apex XD50A Thermal 4x digital zoom, you can draw closer to your target while maintaining your safe distance. You can also see minute details of your target like never before, all on your scope’s screen. In case you want to use an alternative power source, the Pulsar Apex XD50A comes with an optional adapter cable that makes you less reliant on batteries. The Pulsar Apex XD50A Thermal Riflescope comes with a portable and spacious case that makes it easy to carrying it around during travel or on the job. You can chose to view in forest, rocks or identification mode with your Pulsar Apex Riflescope, as and when your terrain and position requires it. These modes improve the contrasts of your target to give you an enhanced view. You can choose from manual, automatic or semi-automatic modes to calibrate the scope for an enhanced view. The automatic modes allow you to calibrate your scope in a matter of seconds, and this can be very useful if you are in too much of a hurry for some action. The scope is very durable. It comes with a warranty card. It delivers very vivid images. There is a cleaning cloth included in your purchase. It comes with an adapter cable. The package comes with 2 batteries. The device comes with wireless remote control. It has a 1,400yd human detection range. It has a relatively affordable price, compared with riflescopes of similar quality. It requires only 2 batteries to operate. It has an external dampening system that helps in a very significant way in keeping the thermal core stable. The device comes with an updatable software that ensures that the device keeps improving its performance. It features as many as 10 excellent variable electronic reticles. Its portable case comes in only one color, black. Q. Who are the manufacturers of Pulsar Apex XD50A Thermal Riflescope? A. Yukon Advanced Optics Worldwide produces the Pulsar Apex XD50A Thermal Riflescope. 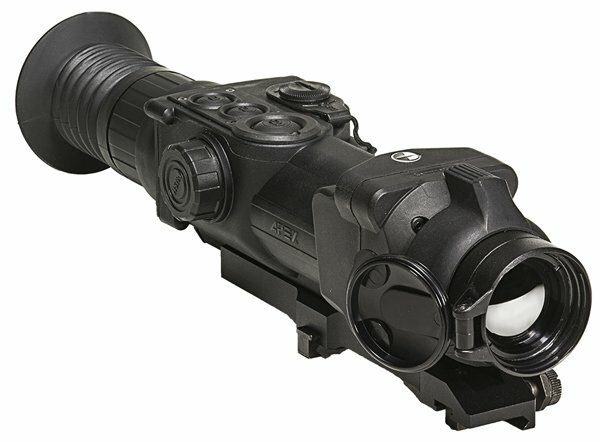 Yukon Advance Optics is a manufacturer of a wide range of civilian thermal devices, and has been in business since 1994. Some of the company’s customers include hunters, surveillance experts and fisher folks. A. Yes, the riflescope is shock-resistant. Q. What colors can I purchase the Pulsar Apex XD50A Thermal Riflescope in? Q. Is the Pulsar Apex XD50A Thermal Riflescope water-resistant? A. Yes, the riflescope is water resistant. A. No, the riflescope does not come with a lanyard. A. The riflescope weighs 24 oz. A. Yes, the riflescope comes with a limited warranty. A. Yes, the riflescope comes with an optional external power supply. A. No, the scope can be used for surveillance, security, law enforcement and activities that require shooting at long distances. Indeed, the Pulsar Apex XD50A Thermal Riflescope is indeed one heck of an excellent sighting equipment with multiple features that provide value for money. Features such as: a shock-resistant body, one-shot zeroing with a freeze, water-resistant body, wireless remote control, high-resolution LCD display, and multiple operation modes, among others make the Pulsar Apex XD50A Thermal Riflescope the ultimate sighting equipment for security, surveillance, hunting and law enforcement activities alike. We hope that you have found in this review good reasons to make a purchase.